Celebrate a 4th annual vegan Compassionate ThanksLiving Potluck this Monday, October 13th by partaking in this feast of thanks and bounty. Build community and share delicious nourishment with like-minded people. Socialize with new and old friends over a selection of live musical entertainment. All are welcome to attend! Animal Voices and Drishti Point Yoga Radio present 4 events in 3 days: Thurs Feb 13, Fri Feb 14th, and Sat Feb 15. 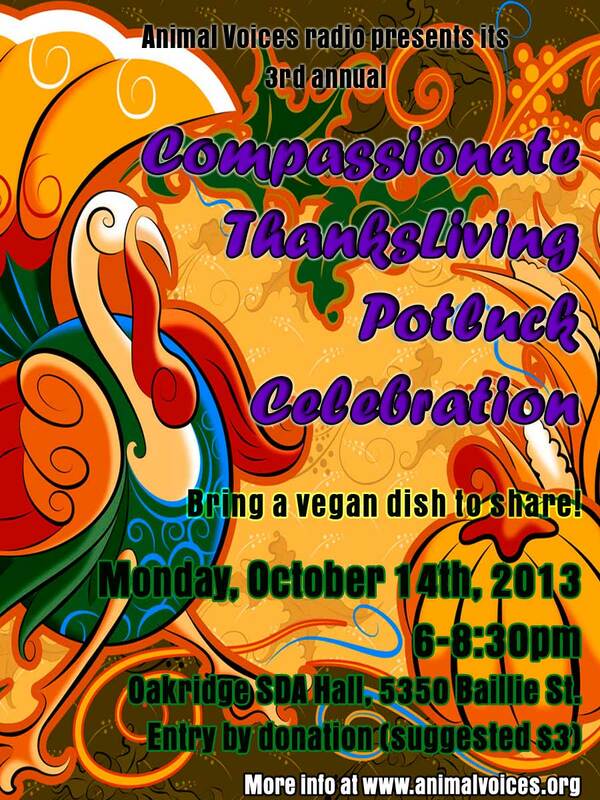 You are invited to Animal Voices' 3rd annual Compassionate ThanksLiving Potluck Celebration! It takes place on Monday, October 14th. Animal Voices is hosting its 2nd annual Compassionate Thanksgiving Potluck... and Variety Show! Monday, October 8th, 2012 at St. James Community Square at 6pm. All are welcome to attend. We are teaming together with RawBC to bring to you an end-of-summer outdoor vegan potluck celebration on September 16! All are invited to attend.